How Corporate-Crafted Legislation Brands Activists as Terrorists: A policy paper showing the influence of model legislation drafted by the American Legislative Exchange Council (ALEC), a conservative group of state legislators, on state legislation around the country. Federal legislation passed in 2006, the Animal Enterprise Terrorism Act (AETA), was largely drafted by ALEC and has drawn a great deal of attention and criticism from animal rights and environmental activists. The Act which purports to protect animal enterprises from so-called “eco-terrorists,” is a vague and unnecessarily broad law that has already been used to restrict First Amendment rights. 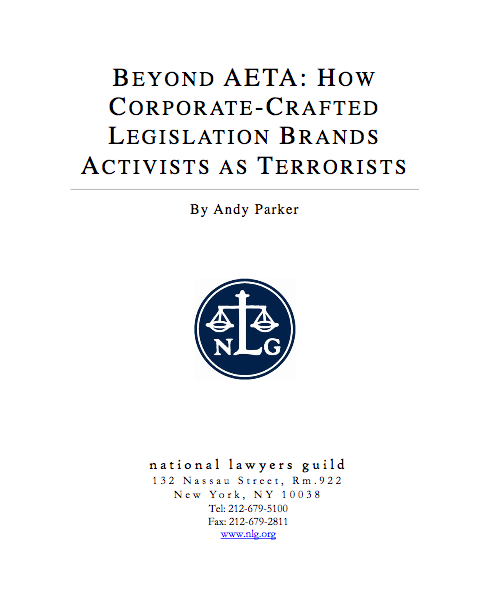 The Guild’s policy paper, Beyond AETA: How Corporate-Crafted Legislation Brands Activists as Terrorists, explains that AETA is not unique in this respect. Similar bills have been introduced in several state legislatures over the last few years, and most of them stem from the model bill produced by ALEC.